Higher education expert William F. Massy’s decades as a professor, senior university officer, and consultant have left him with a passionate belief in the need for reform in America’s traditional universities. 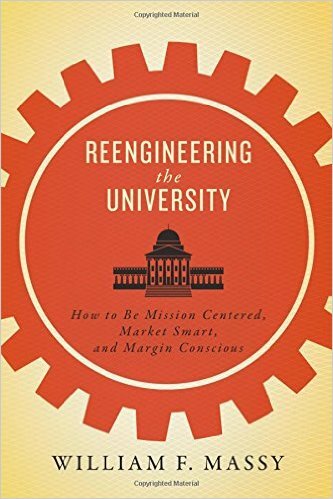 In Reengineering the University, he addresses widespread concerns that higher education’s costs are too high, learning falls short of objectives, disruptive technology and education models are mounting serious challenges to traditional institutions, and administrators and faculty are too often unwilling or unable to change. An expert microeconomist, Massy approaches the challenge of reform in a genuinely new way by applying rigorous economic principles, informed by financial data and other evidence, to explain the forces at work on universities and the flaws in the academic business model. Ultimately, he argues that computer models that draw on data from college transaction systems can help both administrators and faculty address problems of educational performance and cost analysis, manage the complexity of planning and budgeting systems, and monitor the progress of reform in nonintrusive and constructive ways.